Potamogeton crispus is an aquatic plant that grows in fresh and slightly brackish waters. It becomes invasive in some areas because of its tolerance to low light and low water temperatures. These tolerances allow it to outcompete native plants in the spring. Using this life cycle, P. crispus can be controlled best in spring or early summer when native species are still dormant and temperatures are low enough for endothal herbicides to be effective. Potamogeton crispus “is a submerged, perennial aquatic plant easily identified by lanceolate, reddish-green, wavy leaves with finely toothed margins. The leaves are 0.5-1.5cm wide and 3cm to 10cm long. Stems are branched and somewhat flattened. P. crispus flowers are small, somewhat inconspicuous, and arranged in a dense spike on a curved, 2.5cm to 5cm stalk” (DECFW et al., 1998). Plants can grow to 4m in deep water, with stunted rosette forms of the plant occurring in very shallow water < 0.3m (NIWA, 2004). According to USDA-NRCS (2002), P. crispus tends to increase oxygen levels at day-time and produce substantial organic material in aquatic environments. This pondweed shelters small fish and aquatic insects that provide food for larger fish and amphibians. Potamogeton crispus is found in freshwater lakes, ponds, rivers and streams, and in slightly brackish waters. 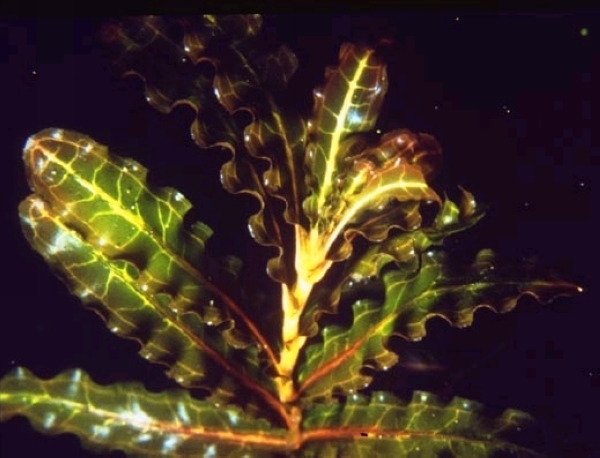 It is tolerant of low light, low water temperatures, and is a species of alkaline or nutrient-rich waters. P. crispus will invade shallow as well as deep water areas (DECFW et al., 1998). According to DECFW et al. (1998), “Potamogeton crispus spreads primarily by burr-like winter buds called ‘turions’ which are hard and prickly. One plant may produce hundreds of turions, which are then dropped to the sediment to germinate the following year. According to Crowell (UNDATED), these ‘turions’ disperse by water movement. It also reproduces vegetatively from rhizomes and stem fragments. 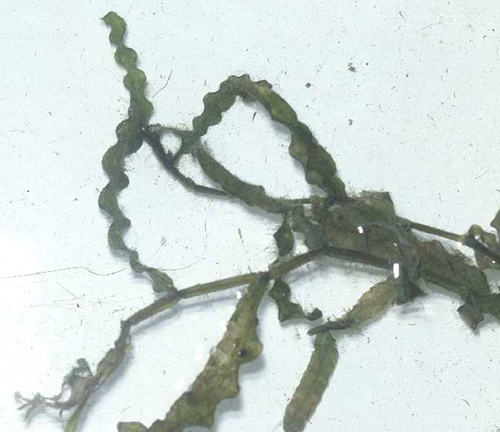 P. crispus can also spread by plant fragments attached to boats and equipment that are not properly cleaned. Seed is set and seedlings are commonly found at field sites. In shallow water it may also set seed and behave more like an annual, whilst deeper water plants persist as perennials (NIWA, 2004). According to Crowell (UNDATED), P. crispus can spread by plant fragments attached to boats and equipment that are not properly cleaned. Principal source: Crowell, W. UNDATED. Curly Pondweed: New Management Ideas for an Old Problem Exotic Species Program, Department of Natural Resources, Minnesota, United States. Recommended citation: Global Invasive Species Database (2019) Species profile: Potamogeton crispus. Downloaded from http://www.iucngisd.org/gisd/species.php?sc=447 on 19-04-2019. Potamogeton crispus can grow in dense beds which outcompete native aquatic plants. The dense surface mats may also interfere with water-based recreational activities (DECFW et al., 1998). Crowell (UNDATED) states that “in some lakes, P. crispus coexists with native plants and does not cause significant problems. In other lakes, it becomes the dominant plant and causes significant problems.” These problems include interfering with late spring and early summer recreation due to the formation of dense mats and an increase in phosphorus concentrations causing an increase in algae blooms and a pile up of dying P. crispus along the shore, both due to its mid-summer die back. Preventative measures: Curlyleaf can spread from plant fragments, so it is important to clean all vegetation off boats and equipment before leaving water access. \r\nPhysical: Curlyleaf pondweed has a unique lifecycle which influences management options for its control. It is the first pondweed to come up in spring and dies back during mid-summer. When most aquatic plants are growing, curlyleaf plants are dying back. Before they die, they form vegetative propagules called turions (hardened stem tips) that disperse by water movement. Turions lay dormant during the summer when native plants are growing, and most germinate when most native vegetation has died back. Long-term management of curlyleaf will require the reduction or elimination of turions to interrupt its life cycle. Management activities should be undertaken in spring or very early summer to have the maximum benefit. Mechanical control includes raking, cutting or harvesting vegetation. Raking and hand cutting generally remove the plants at the sediment surface while harvesting removes the top 5 ft of the plant. Mechanical methods control plants in the specific areas where they are causing a nuisance, and there is immediate relief from the nuisance. There is some evidence that early season cutting of pondweed at the sediment surface can prevent turion production (McComas and Stuckert, 1996). \r\nChemical: According to APIS (2002), chemicals that can be used to control include the herbicides diquat (Reward, Weedtrine-D), endothall (Aquathol, Hydrothol 191), and floridone (Sonar A.S., Sonar SRP). Corwell recommends endothall-based herbicide, such as Aquathol K, because it is effective in 15 degrees C (60 degrees F) water allowing for earlier treatment. Informations on Potamogeton crispus has been recorded for the following locations. Click on the name for additional informations. Aquatic Plant Information System (APIS), 2002. Herbicides Used for Potamogeton crispus (Curlyleaf Pondweed) Management U. S. Army Corp of Engineers. Summary: A list of herbicides for use on P. crispus. Available from: http://www.wes.army.mil/el/aqua/apis/herbicides/html/herbic42.html [Accessed 31 October 2003]. Crowell, W. Undated. Curly Pondweed: New Management Ideas for an Old Problem Exotic Species Program, Department of Natural Resources, Minnesota, United States. Summary: A Minnesota online article that provides detailed management methods and basic description, reproduction, spread, look-alike information, and impacts background about the plant. Available from: http://www.lakewashingtonassn.com/pdfs/curlyleaf.pdf [Accessed June 17 2009]. Department of Enviromental Conservation and Fish & Wildlife (DECFW), Vermont Agency of Natural Resources (VANR), and The Nature Conservancy of Vermont (TNCV ) 1998. Curly Leaf Pondweed DECFW, VANR, and TNCV, Vermont, United States. Summary: A Vermont fact sheet that contains information on description, habitat, threats, distribution, control measures. Available from: http://www.anr.state.vt.us/dec/waterq/ans/objects/clpfs.pdf [Accessed 31 October 2003]. McComas, S. and J. Stuckert. 1996. French Lake (Rice County) curlyleaf pondweed control using a boat-towed cutter, 1996: Status Report. Unpublished report submit-ted to Rice County Environmental Health Department and the French Lake Association by Blue Water Science, 550 S. Snelling Av., St. Paul, MN 55116. 22 pp. Summary: Control and management studies- information. Netherland, M.D., J.D. Skogerboe, C.S. Owens, and J. D. Madsen. 2000. Influence of water temperature on the efficacy of diquat and endothall versus Curlyleaf pondweed. Journal of Aquatic Plant Management 38:25 32. NIWA, Aquatic Plant Management, 2004. Summary: Submerged aquatic plant species guide. Summary: Notes on Chemical control. CWS (Canadian Wildlife Service National Site) 2003. Curly Pondweed Wetland Species Accounts [Online Database] CWS, Canada. Summary: This page includes areas in Canada where P. crispus is a nuisance. Available from: http://www.cws-scf.ec.gc.ca/publications/inv/13_e.cfm#targ5 [Accessed 31 October 2003]. MDNR (Maryland Department Natural Resources) UNDATED. Potamogeton crispus Bay Grasses Identification Key [Online Database] Maryland, United States. Summary: This page includes a description, look-alike information, reproduction, and areas where the plant is a nuisance. Available from: http://www.dnr.state.md.us/bay/sav/key/p_crispus_final.html [Accessed 31 October 2003]. USDA-NRCS (Natural Resource Conservation Service). 2005. Potamogeton crispus. The PLANTS Database Version 3.5 [Online Database] National Plant Data Center, Baton Rouge, LA. Summary: Available from: http://plants.usda.gov/java/nameSearch?mode=Scientific+Name&keywordquery=Potamogeton+crispus&go.x=5&go.y=10 [Accessed 20 March 2006].